A sturdy, yet fiddly machine, that will satisfy coffee connoisseurs looking for great coffee, but not if they’re in a hurry. Here’s our De’Longhi Magnifica ESAM4200 bean-to-cup coffee machine review. Check best prices on Amazon. For the budding barista, the De’Longhi Magnifica ESAM4200 bean-to-cup coffee machine is a great first step in a coffee career. The domestic appliance has all the features of a café unit including a milk steaming wand, an integrated coffee bean burr grinder and a sstraightforwardcontrol panel to adjust strength and length. While it might take some trial and error to pour your perfect brew, once found, the De’Longhi Magnifica ESAM4200 serves a fresh espresso using 15 bar pump pressure, at the touch of a button. Its two-cup feature is also a nice addition. While only available for the black coffee options, the machine automatically adjusts the amount of coffee ground in a single brewing cycle ensuring its perfect for two cups. See also: Nespresso Krups Prodigio review. We also can’t look past its compact design. With the slight dimensions of H36 x W38 x D28cm, this small unit manages to hold a 1.8L water tank meaning several pours before refilling. It’s height adjuster also means you continue to drink from your favourite cup. Once you have figured out your perfect brew, using the De’Longhi Magnifica ESAM4200 couldn’t be easier. It comes down to personal preference whether you would rather a manual or automatic milk steamer, and if you’re not aware of how to use it, the De’Longhi Magnifica milk wand can prove tricky – and messy. But nothing a few YouTube tutorials couldn’t fix. For the most part, cleaning the machine is simple and straightforward. Even the brewing unit is automatically rinsed every time you turn the machine on or off and is removable for easy cleaning and maintenance. However, it does make a bit of a mess inside, so does need regular cleaning. See also: Best De’Longhi Coffee Machine. Is there anything better than a freshly ground coffee? By opting for a bean-to-cup machine, one of the biggest benefits is you can choose what beans you use. But with the De’Longhi Magnifica ESAM4200 machine, it’s difficult to make any bean taste bad. The built-in burr grinder coupled with the 15-bar pump pressure and quality De’Longhi design guarantees a perfect pour every time. And while the milk wand can be fiddly, it works well when used properly, resulting in café quality coffees. The De’Longhi Magnifica ESAM4200 bean-to-cup machine has everything a café unit does but in the dimensions a portion of the size. Retailing at £315.00, if the taste of freshly ground coffee that’s simple to make and never lets you down, then you’ll struggle to do better than this machine at such a price. See also: The BEST capsule coffee machines of 2017. 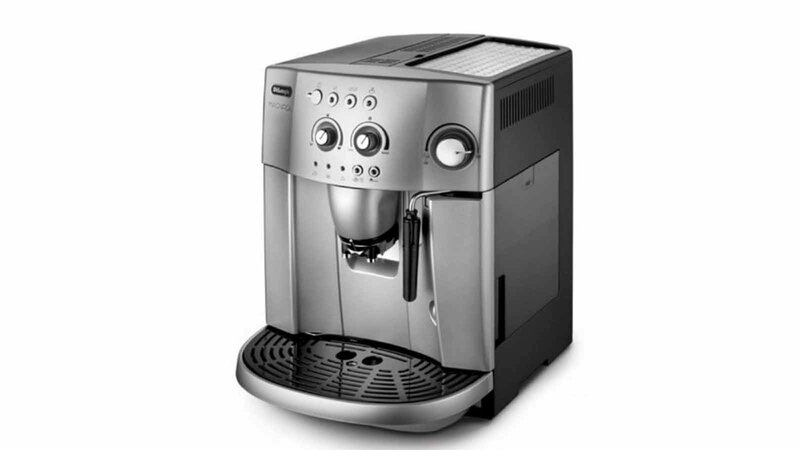 The De’Longhi Magnifica ESAM4200 packs the punch of a coffee shop unit from the quarter of the size. Pods and automation aren’t for everyone, so if you’re serious about freshly ground beans and high-quality brewing technology, this machine is worth every penny.